We can already use our smartphone to pay by fingerprint, and soon we could be paying by face thanks to a new feature debuted by Alibaba at Cebit 2015. First reported by Computer World, Alibaba chairman Jack Ma showed off the new facial recognition feature that allows you to complete a transaction by scanning an image of your face. 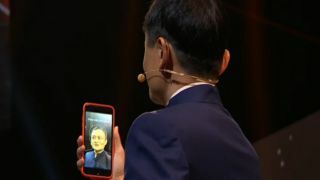 On stage at Cebit, Ma used the Alipay solution to buy a souvenir postage stamp from the mobile version of the e-commerce site and showed that all you need to do to confirm the purchase is take a photo of your face using the front camera. Facial recognition tech has of course been used on smartphones before with Face Unlock available to Google Android phone owners to unlock the screen and Intel exploring it for passwords through its True Key solution. Alibaba, though, is thought to be only one looking at it for financial transactions. Alipay, which was spun off from Alibaba in 2011, already has 300 million users in China and around half of all the transactions it processed last year came from mobile devices. The feature is reportedly known as "Smile to Pay" and has been created in partnership with Megvii, a Beijing-based firm that provides cloud-based facial recognition services. Mobile payments is a huge area of growth around the world and ever since Apple Pay was introduced in September it has accelerated even further, however, consumers will still ultimately decide the fate of the sector and in the meantime the likes of Alibaba debuting new offerings like this can only strengthen its hand. Will Apple Pay change the mobile payments world forever?